I chose to come out of the closet....oh wait.... wrong thread. Because I have so much to offer. Having a legitimate question or comment that I felt would actually add to the conversation. I didn't want to post just to post. I googled a lot about pipe smoking when I started out. I always got the best results on this site. I liked the variety of answers to questions, informative, funny, grumpy, enabling etc., so I decided I wanted to become a part of it. I was lurking for years, but never had anything to add that I thought was worthy, but ... I was tempted oh so many times. Then I bought a Dunhill that I knew was odd but couldn't identify properly and thought I know exactly the place to go for answers! Now I can actually participate in all these conversations that I've been following forever but not joining in. You lot are a goofy bunch, that's for sure. DON'T CHANGE! I drank too much one night. Woke up with email notifications. I spent a lot of time reading reviews over at Tobaccoreviews.com and wanted to be able to converse with fellow pipers instead of just reading reviews. Came over here and signed right up. I just really admired the way you all communicate and how much information is present here. There is an ample dose of civility here, in an increasingly less decent world. I was a lone wolf for a long time. I lurked here for two years before chiming in. I didn’t think I had much to add at first so I stayed in the corner. Then one day I decided to post a reply and realized I had an informed opinion. Of course many didn’t agree or had their own opinion on the matter. But Instead of shying away I realized it was ok to discuss and not be scared off. All roads seemed to lead here. I accepted that this site is where my learning curve could be expedited. 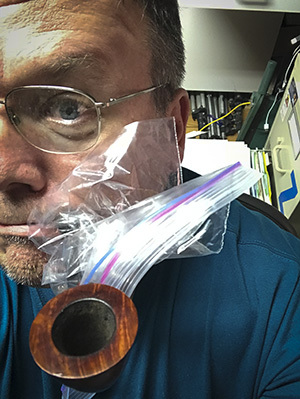 Now it's become as much a part of the pipe smoking experience as the pipes and mixtures. I made it through this taunting and found my Cajones. I joined because all my pipe related Googleing always led here and also I dont known any other pipe smokers to discuss the hobby with. Simply put, I had questions and knew this was the place to get answers. I had been on the pipes.org forum for years, when the site owner screwed up transitioning the site to a new platform and unlinked the forum. By the time he got around to fixing the link it was too late. So I looked for a new place to hobnob with my fellow pipesmokers and landed here. I think I lurked for about a day before signing up. Great responses and hopefully we pull a few more out from the shadows. I did a lot of internet research about pipe smoking before I decided to finally purchase a pipe and tobacco and give it a try. The community here consistently offered both useful insights and entertainment, so after my first smoke I was excited to hop on and join in the conversation. I still tend to do a lot more reading than posting, as evidenced by my meager post count. I had poor results when I started so I wanted to join so I could sell off my stuff. The forum required 100 posts, so I started posting. In that time, I learned everything I was doing wrong. Next, I tried smoking again. This time, I was smoking a better tobacco with tried and true technique. I believe it was the member with the Blackhouse obsession/Tattoo that set me straight. In any case, I never quit. I did eventually sell off my initial pipes and acquire a style that accommodated my smoking better. You guys are great. I enjoy this forum. I like the way Kevin runs his ship. Seriously? IT"S THE PIPE BABES! the crew of the Black Frigate? I guess they are alright looking. I joined because people here have a wealth of experience in all aspects of pipe smoking. It has given me a lot of laughs as well as the tips and tricks of experienced members. Being a member of the forums has made my pipe smoking a much better past time. The information and vast amounts of knowledge shared, also the sense of humor in threads. I also appreciate the layout and the forum rules. This is a well-managed place. I don't post all that much, but I do read what's on here on a daily basis. I appreciate the different perspectives and the vast wealth of knowledge thrown in with a bit of sarcasm and good natured ribbing. It reminds me of the days when I worked in a Tobacco Shop and our motto was "Good price on tobacco and as much free abuse as you can handle". I like this site as it is educational, enlightening, and entertaining. Best of all, no commercials. I usually hang out in the back row until I get a feel for the place. I have several interests and hobbies so I've been on numerous other forums where the environment can get, shall we say a little hostile. Especially to newbies and the repeated same questions over and over but I have never seen that here. Never have I experience such an inviting and genuinely welcoming environment as such that we have here and I only lurked for a few hours before jumping in. Haven't seen much bickering here and I think the fact that we keep politics out of the equation really helps. Also the sense of humor here, albeit a little dry at times can be very entertaining. (Talking to you Cosmic)! Also, since there is no B/M within any reasonable distance from me, this is my place to hangout and smoke, make friends, research and get great advice. I know for a fact, the things I've learned here have shaved years off of my learning curve and pipe smoking is now a firmly ingrained part of my life. My ever growing cellar is a direct result of reviews here and at TR. Hobbies and interests come and go but piping for me, is for life. Looking forward to being here for a good long while. Kevin made me a mod so I had start smoking a pipe and post here. Fourteen days had passed without an "Where Can I Find Esoterica?" and so I just had to jump in. Great community full of really reasonable people. It's hard to get the number of posts for Secret Santa/Buying/Selling if you don't have a lot to say. But great info here, and I wouldn't be on the Black Frigate or the 633 Train without your fine counsel and guidance. I went from active to lurker... does that count too? clickclick, hey! Good to hear from you again, if only momentarily. Maybe you could post again with recent pipes of your creation. So, why didn't I lurk? The term blabbermouth comes to mind. The rumors of impending McClelland's closing got me off the pot and motivated. What, have you heard something? Crap!!! Should I start buying? I lurked for a few days before finally making my first post. I can't remember what exactly brought me around to finally posting but I'm glad I did.